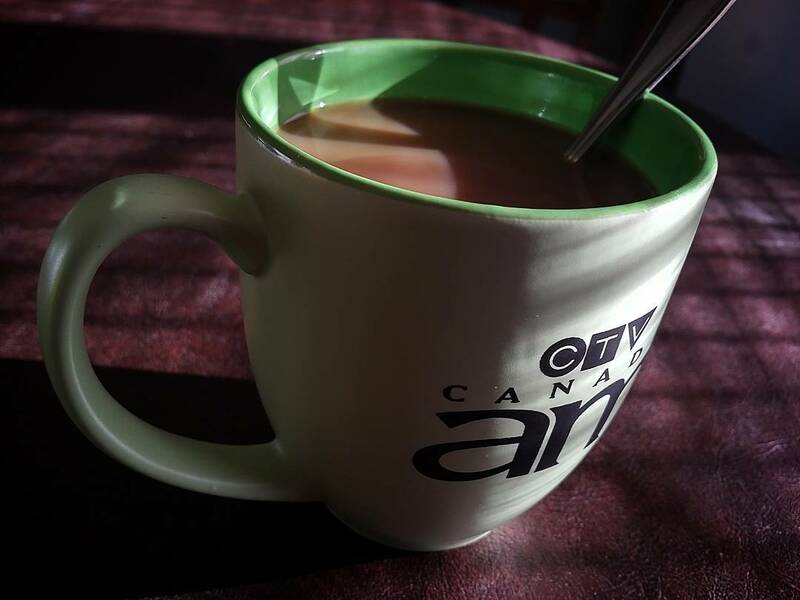 The green Canada AM mug in the photo here has an interesting history. I got it when I was in Toronto for an in-studio interview in September. Since most of my work with this program is normally done remotely from a studio in London, I jumped at the opportunity when I got called for an interview while I was already in Toronto for some training. One pre-dawn drive across the DVP and the 401 later, I found myself parking my CTV truck on some pretty hallowed ground. It was, as you can imagine, an amazing experience that came with more than its fair share of pinch-me moments. Getting to work in the same halls and studios of folks you've idolized for ages was - and is - the kind of thing that makes me glad I'm still alive. Vicky is responsible for juggling the never-ending array of guests and their needs. You'll probably never cross paths with a more gracious or organized person, and in those quiet moments where you're thinking you might be out of your league, she somehow manages to get you in the right zone. That includes the green mug you see here. Because I'm an idiot and I notice these things, I admired the color and texture, and we both agreed someone deserved a raise for the guest-mug upgrade. She said I could take mine home if I wished, and I promised I'd return her gesture by sharing the mug's story online. I even tweeted it from the green room and here's Marci Ien's pic of me and Bev Thomson - with the mugs - chatting on-air. Fast-forward to home later that day, and I was still pretty pleased with a) the in-studio experience and b) the neat keepsake. To this day, the mug gets smiles from everyone in the house every time I pull it out of the cupboard. My wife and kids know how ridiculously happy it makes me despite the fact that it's "just" a mug. In the end, though, it isn't "just" a mug more than there's "just" an anything. This seemingly insignificant green cup is a reminder that good people are all around us, that small gestures can ripple over time and distance, and slowing down to appreciate the moment is always the right thing to do. Your turn: What's your favorite mug? Why?